The other day I was hungry. Okay, that’s pretty much three times a day (at least), every day… but this particular day, I was hungry for something special. Something new. Something different. Have you ever done that? You’re craving something, and not really sure what? But nothing will satisfy you until you get THAT something. I looked in my fridge and pantry two dozen times, I bet, trying to find that something. Luckily, I saw an ad for Arby’s new Smokehouse Brisket sandwich and I knew. Just knew… that was IT. If you haven’t tried Arby’s new Smokehouse Brisket sandwich, yet, you need to get on over to your nearest Arby’s and try it. It is so full of smoky tenderness and richly satisfying. Find an Arby’s near you. I’m starting to drool just thinking about it. Seriously, it is THAT good. The beef brisket is smoked for at least 13 hours. It’s smoked low and slow, but always hot and ready for you. Arby’s Smokehouse Brisket Sandwich is stacked high with slow-smoked beef brisket, then topped with smoked Gouda cheese, crispy onions, BBQ sauce and mayo, and served on a toasted, bakery-style bun. It tastes as good as it looks, too. Dang, I’m craving one now. I love that we have an Arby’s near us. When I do have a craving for a sandwich, nothing beats a sandwich from Arby’s. 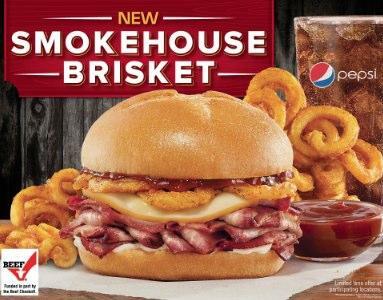 And now that they are offering the new smokehouse brisket sandwich, I seem to have a need to stop by Arby’s more often. I think I know what’s for dinner. Maybe when I pick my son up from school and run a few errands, we’ll make a stop at Arby’s. Why are you excited to try the new Smokehouse Brisket sandwich? This looks tasty! I wish we had an arby’s near by. I’m sold..this looks soooo good! I rarely go to Arby’s but I have to say that sandwich looks really tasty! That sandwich just made me drool a little. I still have never tried Arby’s. I recently discovered one in a neighboring city and have been asking my husband to take me there some time. It’s on my must-try list! Maybe we’ll finally make it to Arby’s this weekend. I just wish there was one closer to me. My husband had this a couple of weeks ago and loved it! not yet but I need too! It looks really good. I’ve never had Arby’s but I intend to try it soon! I haven’t tried it but it LOOKS SO Good!!! We don’t have one in our town so I have to wait till we head over to our next town before I can try one! I have, and I really like it! I haven’t tried it yet, but I really need to. I love BBQ. I know that my husband would love this! This looks delicious! I really like the crispy onions, for that extra bit of crunch and texture. I’ll definitely be trying this. I need to go to Arby’s ASAP! I was just telling hubby yesterday we haven’t been to Arby’s in forever. There are not too many in our area. That looks great I have not yet tried it. I keep seeing this sandwich on other blogs and everytime I do it makes me hungry! Guess it’s time to go and get on. I have and it is very good my fiance sends me to get one every weekend. Yes, I’ve been hungry for something new often. Sometimes the same things just burn you out! I need to give this sandwich a try. No, I don’t like junk food. I just tried this on Friday! It’s really good! Our Arby’s is really far out of the way. My husband would really like this sandwich, though. I haven’t tried it yet, but it looks so good I may have to go this week! I love gouda cheese and those crispy onions really have my mouth watering! We do not have an Arby by us and my mouth is watering looking at the sandwich. There is rumors that one will be opening two town overs next year. Keeping my fingers crossed.